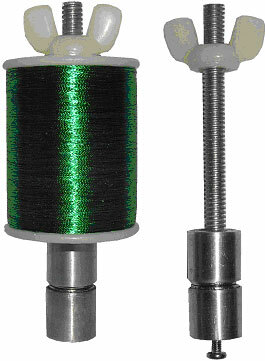 This unique State-of-the-Art Thread Tension Device is designed for the professional. It is superior in performance compared to any other tensioner available. This device will not abrade, tear, or cause fuzzies on the foil of even the finest metallic thread. The thread comes directly off the spool and does not pass through any part that could damage it. The tension is adjustable and is supplied by the use of opposing magnets on the spool shaft. This device can be mounted in any position by means of the screw at the base of the device. The Neptune Thread Tensioner will handle small and large thread spools.